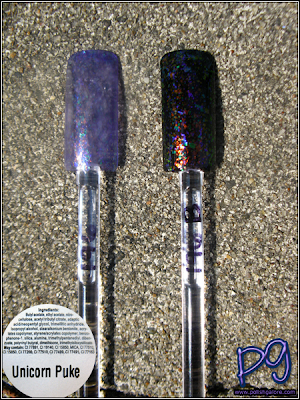 Cult Nails set up a polish frenzy with Unicorn Puke, a purple blue based multi-colored flakie. I first got to see this at Cosmoprof when I met with Maria, owner of Cult Nails, but now it's finally mine. Maria had a pre-sale of 250 bottles of Unicorn Puke, maximum of 2 bottles per customer, so I bought my two. Please don't go searching for this on eBay unless you want to pay for the Unicorn Puke sticker on the bottom and gold writing on the bottle. 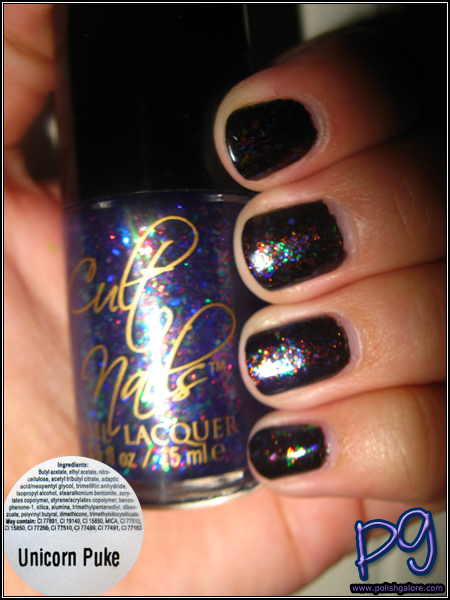 This color has been renamed "Clairvoyant" and will be available in the 2011 Winter "Super Powers" collection which was available for pre-sale last week. If you'd like to read about the eBay situation, please visit Maria's blog posting here. Back to this baby. 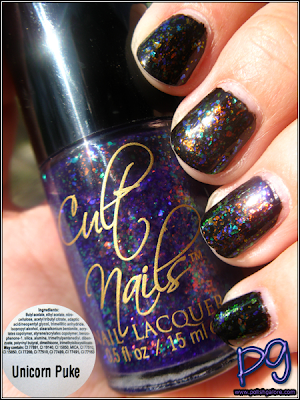 I decided to layer it 2 coats of it over nubar Noir and top it with Seche Vite. 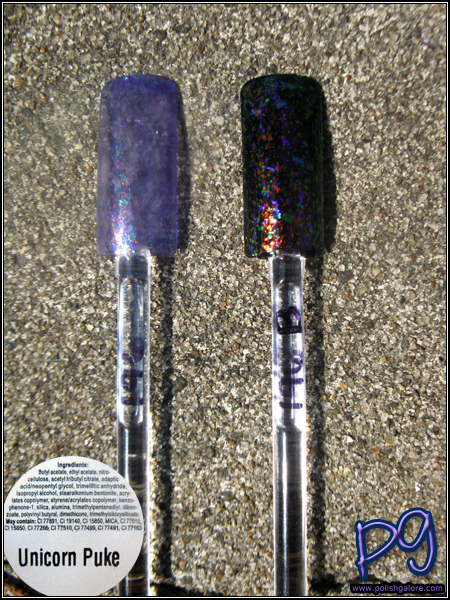 Before I show you that, here is what it looks like on my nail stick. On the left is several coats of Unicorn Puke by itself. As you can see, it has a purple blue base. On the right is 2 coats over the nubar noir. LOOK AT THE FLAKIES. 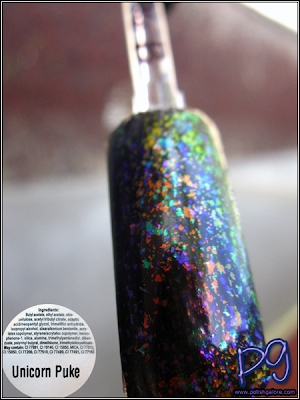 I finally realized what flakies remind me of... fish food! I love it. Look at the colors - red and gold and green and purple and blue. Unicorn Puke! If you're wondering about the name, it's a bit of a play on Unicorn Pee, also known as Clarins 230. It's a multi-colored polish that normally sells for around $70 on eBay. 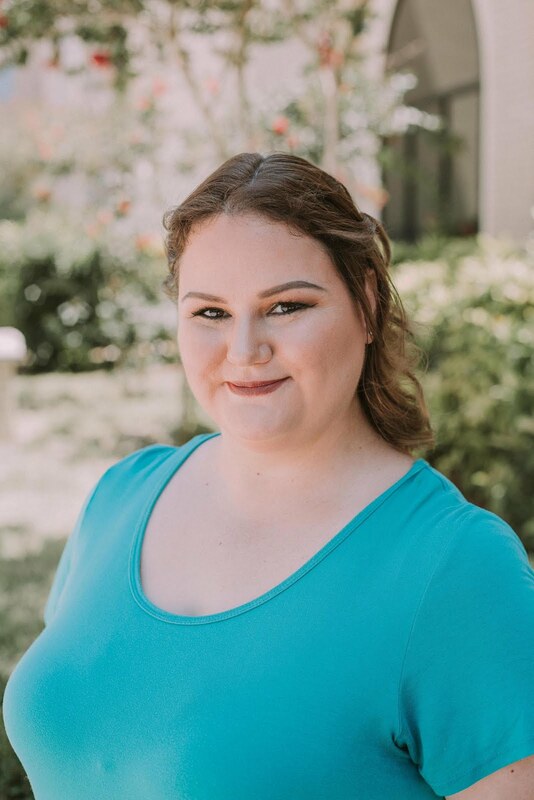 Here is Chloe's Nails' blog posting on the pee itself. (That was a fun sentence to write.) Maria originally wanted to make something similar to Clarins 230 but with flakies instead of shimmer, so this is how it came about! This beautiful girl doesn't like to photograph. I wore this for several days and this is after day 3, so sorry for the tipwear. My shade picture is one of the few where you can really see what's going on. Lots of color, lots of fun. Almost reminds me a bit of a graffiti wall as well! Indoors with the flash doesn't do it much justice either. Again if you missed out on the Unicorn Puke sale, please note that this same formula, color and everything is being renamed Clairvoyant and will be available this winter! Cult Nails is available in their shop for $12 a bottle. 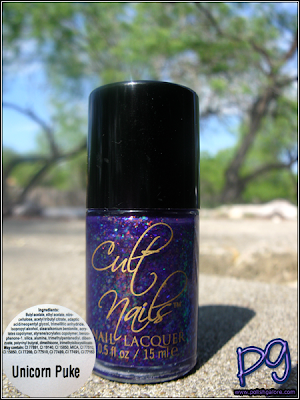 You can like Cult Nails on Facebook and follow them on Twitter. Once they reach 5,000 Likes on Facebook, Maria will be offering all polishes for only $5! I ordered the set because I wanted this polish so much. I can't wait to get it after seeing your pictures. A rather unsavoury name but gorgeous colours!! That is gorgeous! The name makes me giggle - But I also use unicorn farts in my every day vernacular! Where do you get your nail sticks from? If you could email me @ topolishornot@hotmail.ca it would be much appreciated!! !